This article is about the 2019 TV series. For the entire franchise, see DC Super Hero Girls. Promotional poster featuring (from left to right) Zatanna, Supergirl, Wonder Woman, Jessica Cruz, Bumblebee, and Batgirl. The series follows the adventures of teenage versions of Wonder Woman, Supergirl, Bumblebee, Batgirl, Zatanna, and Jessica Cruz, who are students at Metropolis High School. Due to the success of the web series of the same name, a television iteration of the series was announced in May 2017. Lauren Faust, who had developed the cult favorite Super Best Friends Forever shorts, serves as executive producer. 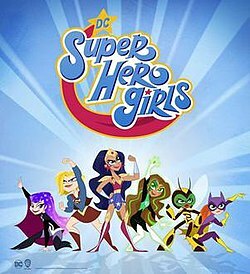 Tara Strong and Nicole Sullivan each reprise their roles as Batgirl and Supergirl from Super Best Friends Forever, while Grey Griffin, who previously voiced Wonder Girl (Donna Troy) from the DC Nation Shorts, reprises her role as Wonder Woman from the web series. A year later, a poster showing the first look of the main characters was released. The series is animated by the Canadian studio Jam Filled Entertainment. The title of every episode and short is styled as a social media hashtag. Batgirl is annoyed when her friends, Wonder Woman, Supergirl, Zatanna, Green Lantern, and Bumblebee, face the villain Mr. Freeze without her. So she has to wait for her father, Commissioner Jim Gordon, to fall asleep so she can sneak out of the house and join the fight. Note: This short was included with the theatrical release of Teen Titans Go! To the Movies. It follows the same premise as the Super Best Friends Forever animated short "Time Waits for No Girl", which was part of the DC Nation Shorts block on Cartoon Network in 2012. After discovering that Supergirl flies in her sleep, Batgirl runs herself ragged chasing her across the city to keep her out of trouble. Batgirl sees what she thinks is the Bat-Signal and gets ready to prove her worth as a sidekick to Batman. But when it turns out to be the shadow of an actual bat in her room, she flies into a terrified panic trying to chase it out. Tasked with looking after the school's hamster mascot for the weekend, Batgirl has her hands full trying to stop it from ruining a health inspection at the burrito restaurant where she works. Batgirl's overuse of emojis while texting leaves Wonder Woman, Bumblebee, and Green Lantern stumped when she tries to call for their help in battling Poison Ivy. Supergirl puts on a new dress for picture day at school, only to shred it piece by piece as she deals with a string of emergencies on her way to class. Zatanna's spell to help Batgirl and Commissioner Gordon better understand each other backfires, causing Batgirl to switch bodies with people all over the city. A malfunction in Bumblebee's suit leaves her scrambling to get to class on time so she can keep up her perfect attendance record. A string of gadget design failures pushes Batgirl to the brink of giving up crime-fighting. Green Lantern and Wonder Woman try to persuade Batgirl to clean up the hideout before her collection of gadgets and junk completely fills it. As hall monitor, Bumblebee goes head-to-head with the cocky Hal Jordan to get him to obey the rules. Aqualad buys a pet goldfish to give to Bumblebee for her birthday, but one mishap after another sends him scrambling across Metropolis to deliver it intact. Weakened by overexposure to kryptonite, Supergirl relies on Wonder Woman to nurse her back to health, but soon starts to take advantage of being waited on hand and foot. The Flash encounters repeated distractions while trying to deliver a cake to a party across town within 10 minutes. Bumblebee gets the last taco on Taco Tuesday, but Giganta will do everything in her power to make sure she doesn't keep it. Supergirl is excited to see a new horror movie, but must contend with a theater full of rude patrons. On her first day as a new student at Metropolis High School, Barbara Gordon begins to suspect that some of the students possess superpowers. She starts a cafeteria-wide food fight that lands her and four other students, Karen Beecher, Jessica Cruz, Kara Danvers, and Zee Zatara, in detention. They are soon joined by a sixth girl who has been picked up by a truant officer. She reveals herself as Wonder Woman, and the others expose their extraordinary abilities as they argue and fight, confirming Barbara's suspicions. Wonder Woman offers to train them as heroes; in return, they show her how to act like a typical teenager and give her the civilian name "Diana Prince", and they take on the hero names of Batgirl, Bumblebee, Green Lantern, Supergirl, and Zatanna. Meanwhile, squads of robots owned by Lex Luthor begin to demolish businesses all over Metropolis, and the six heroes' attempt to stop them results in the destruction of a popular teenage hangout and the end of their new friendship. Wonder Woman's overprotective mother, Queen Hippolyta, arrives to take her home to the Amazons' island of Themyscira as punishment for sneaking away, but Batgirl persuades the other four to help bring her back to Metropolis so she can fulfill her dream of protecting the world of man. The six confront Luthor's robots at an amusement park pier, but discover that his younger sister Lena has commandeered them in a plot to keep teenagers from having any fun. The heroes destroy Lena's command robot, ending her scheme and earning praise from the public, and renew their friendship. Three months later, the hangout has been rebuilt and Barbara shows off a subterranean command center she has built underneath it for the team's use. Dubbing themselves the "Super Hero Girls", they dedicate their efforts to keeping Metropolis safe from evil. Zatanna leaves her two magic rabbits in Supergirl's care for the afternoon, but warns her to keep them separated at all times. When Supergirl ignores the warning and lets them out of their cages, they magically reproduce so quickly that they threaten to overrun all of Metropolis. Zatanna berates Supergirl for her carelessness, explaining that the two rabbits' love for each other allows them to reproduce when brought together. The girls are unable to keep up with the stampede, and a hate spell cast by Zatanna only causes the rabbits to merge into a giant monster that swallows Supergirl whole. However, she breaks free with the original two rabbits and reluctantly pulls them apart, causing the others to disappear. Later, Zatanna again leaves them with Supergirl, who secretly promises to let them out. Just before Metropolis High's latest football game, Hal Jordan's ex-girlfriend Carol Ferris arrives on campus as a cheerleader for the rival team. Carol is still furious at Hal for the way he broke up with her, and she manifests her powers as Star Sapphire and targets both him and Jessica, thinking mistakenly that Jessica stole him from her. Without using her own powers in aggression, Jessica shows Carol the truth, convinces her of Hal's flaws, and tells her that she needs to love herself first. Carol leaves, but vows to make Hal worthy of her love one day. Barbara enjoys her job at the Burrito Bucket restaurant, but she has been late so many times that her boss, Shane O'Shaughnessy, is ready to fire her if she makes one more mistake. When Barbara spots a bank robbery in progress across the street, she invents one excuse after another to ask Shane for time off so she can suit up as Batgirl and stop the criminals. However, she keeps running out of time before she can end the robbery, and even her emergency call to the Flash proves no help. Shane eventually fires Barbara for failing to complete a large order of burritos, but when the robbers target the Burrito Bucket, she creates a new superhero identity - the "Burrito Bucketeer" - and defeats them. Grudgingly, Shane re-hires her and names her "Employee of the Night". Fed up with being constantly upstaged by Diana in every aspect of school life, Barbie Minerva steals a golden cat idol from her father's collection and tries to put a curse on Diana. The girls find that someone has shredded Diana's decorations for a school dance, assume their hero identities, and split up to search the school. One after another is incapacitated by an attacker with superhuman speed and agility, and Wonder Woman - the last one standing - finds it to be a human-sized cheetah, who transforms into Barbie after being knocked out. Barbie admits that she created the "creature" out of jealousy toward Diana, who advises her not to compare her successes to those of others. After Diana leaves, though, Barbie revels in the powers granted to her by the cat idol and vows revenge, adopting the supervillain identity of Cheetah. ^ a b Milligan, Mercedes (May 21, 2018). "First Look at DC Super Hero Girls Designed by Lauren Faust!". Animation Magazine. Retrieved September 10, 2018. ^ Barr, Calvin (February 15, 2019). "DC Super Hero Girls: Sweet Justice Trailer Previews Cartoon Network Series". ScreenRant. ^ Boucher, Geoff (February 14, 2019). "DC Super Hero Girls: Trailer Arrives For New Cartoon Network Series From Producer Lauren Faust". Deadline Hollywood. ^ a b Faust, Lauren (February 19, 2019). "@KariWahlgren and @mallorylow. Just wait until you hear them!!! They're wonderfully horrifying!". DC Super Hero Girls. Twitter. Retrieved February 19, 2019. ^ Pedersen, Erik (May 23, 2017). "DC Super Hero Girls: Cartoon Network Sets Toon Series For 2018". Deadline Hollywood. Retrieved May 23, 2017. ^ "UPDATED: SHOWBUZZDAILY's Top 150 Friday Cable Originals & Network Finals: 3.8.2019 - Showbuzz Daily". www.showbuzzdaily.com. Retrieved 11 March 2019. ^ "UPDATED: SHOWBUZZDAILY's Top 150 Sunday Cable Originals & Network Finals: 3.17.2019 - Showbuzz Daily". www.showbuzzdaily.com. Retrieved 19 March 2019. ^ "SHOWBUZZDAILY's Top 150 Sunday Cable Originals & Network Finals: 3.24.2019 - Showbuzz Daily". www.showbuzzdaily.com. Retrieved 26 March 2019. ^ "SHOWBUZZDAILY's Top 150 Sunday Cable Originals & Network Finals: 3.31.2019 - Showbuzz Daily". www.showbuzzdaily.com. Retrieved 2 April 2019. ^ "SHOWBUZZDAILY's Top 150 Sunday Cable Originals & Network Finals: 4.7.2019 - Showbuzz Daily". www.showbuzzdaily.com. Retrieved 9 April 2019. This page was last edited on 20 April 2019, at 05:39 (UTC).